After 35 years of broadcasting hockey, you'd think Mike "Doc" Emrick would have the hang of it. He does and if you could have the pleasure of listening to him describe the career that has earned him this year's Foster Hewitt Memorial Award, you would realize he is the same man in person as in front of a microphone -- gracious, erudite, excitable and fun. On the eve of his induction into the Hockey Hall of Fame, Emrick reflected on his career that began with announcing parts of games at Bowling Green University, where he got his doctorate in radio-television-film. Hence, the nickname. He had been teaching near Pittsburgh and was looking to get his doctorate. "I was considering going to Michigan or Bowling Green for my doctorate and Bowling Green University had the local NPR station with All Things Considered and their usual shows," Emrick said. "They had a staff member who broadcast the first and third periods and they felt a student should do the second period. "That's what Bowling Green offered me that Michigan could not. That made it pretty easy to make up my mind." Emrick moved on to be the announcer of the Port Huron Flags of the International League and his work led to his hiring as an announcer on Philadelphia Flyers games. He stayed in the New Jersey Devils' broadcast booth from 1983 to 1986 before returning to the post in 1993, and has been with the team for its 3 championships. Emrick has worked for just about every network that has broadcast NHL hockey, including CBS, NBC, Versus, TNT, ESPN, Fox, ABC, CSTV, SportsChannel Philadelphia, Prism, Fox Sports Net, and others. He has also done national basketball, lacrosse and football broadcasts as well as other sports in 2 Olympics. Emrick said one regret is that he never heard Foster Hewitt broadcasting live. "Unfortunately, I never heard Foster Hewitt when I was growing up," Emrick said. "Our world in Indiana began and ended with the International League's Fort Wayne Komets and their great broadcaster, Bob Chase. He's still doing Komets games today at age 82, his 56th year. "It wasn't until I got out of college and Dan Kelly was doing the nationally televised games on CBS in the 1960s that I began hearing the great announcers. I was up in Michigan on the Great Lakes when I heard Danny Gallivan and Bill Hewitt doing Toronto Maple Leafs games on the CBC. I don't think I ever heard Foster Hewitt doing a game live. Of course, I've heard his work while looking at tapes and highlight films. "Danny Gallivan was a great influence on me and so I was pleased to meet him and be a member of the broadcasters' association when he was a kingpin in that organization. "It was 1980 and I had just come into the NHL as a cablecaster for the Philadelphia Flyers and they encouraged me to go to the draft in Montreal," Emrick said. "There was a meeting of broadcasters in the Queen Elizabeth Hotel in a room on the side of the building that faced the cathedral with the statues of all the saints around it. Dan Kelly is talking about Gallivan and Danny is sitting there, trying to be humble. At that time, there were no broadcasters in the Hockey Hall of Fame and Dan Kelly said in that big, booming voice of his 'If we ever have anyone in the Hall of Fame, it's going to be that guy there. Look at the church and the statues of the saints. That's where that man belongs. If it was any of us up there, the people below would be yelling jump, jump, jump. "Danny Gallivan always had a prosaic way of saying anything. 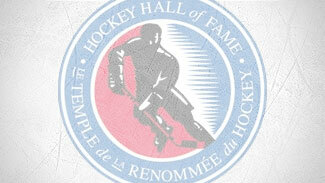 At the time, the only way you could get into the Hockey Hall of Fame was as an honored member. "They didn't have a hockey writers or broadcasters wing, but there was some talk about doing it. Danny always insisted he didn't want to go in before Milt Dunnell. And, he said Milt should be first. Boy, I was eavesdropping on legends." Dunnell was a writer and sports editor for the Toronto Star and wrote on all sports in a 50-year career. Gallivan and Dunnell entered the Hockey Hall of Fame the same year. Dunnell won the Professional Hockey Writers' Association Elmer Ferguson Award in its inaugural year, 1984, and Gallivan won the Foster Hewitt Memorial Award. "One more Dan Kelly story: It was 1987 and I was doing the seventh game of the Stanley Cup Final for ESPN, Philadelphia at Edmonton, and I had never done a seventh game in my seven years in the NHL," Emrick said. "Sometimes, I don't sleep too soundly before a big event and that was the case the night before the game. Dan Kelly and John Davidson were doing the game for Global Sports TV in Canada. John comes walking into the media room and Kelly booms out, 'Hey, Big Boy, how did you sleep last night?' and Davidson said he did well. "'Well, I didn't,' Kelly said. I thought if the great Dan Kelly didn't sleep well before Game 7s, then I was relieved because I didn't either and I don't know how many of those he did. You're always nervous in that situation." "I have no idea how I will react when I get up to accept this award. I think it will be like when I received the Lester Patrick Trophy a few years ago. You see your whole professional life go before you. I'm sure it will be a memory in the making but I don't know how it will grab me. I can't get into too much trouble because I have only 4 minutes to speak." Emrick's move to the Devils saw him work for a team that was shaking off some awful seasons and blossoming into a contender. He has enjoyed his years with the team and the opportunity to broadcast 3 Stanley Cup championships for the home fans. He said the first sticks in his mind because the Devils weren't supposed to win. "If you remember, in 1995, Detroit was supposed to win the best-of-7 Stanley Cup Final against the Devils in 3 games. The fourth would be surrendered," he joked. "Just raise white flag. That was FOX's first year doing hockey and we had only Games 1 and 4, John Davidson and I. We were in Game 4 and Shawn Chambers scored to make it, 5-2. That's when we knew Detroit was going out in a sweep and the Devils would win their first championship. "John said, 'Doc, you have some minutes to go. Make sure you enjoy this time.' And then we had that closeup of Mike Peluso in tears. John always kept track of everyone's shifts in those days before real-time scoring and he already knew Mike had missed a shift on the line with Randy McKay and Bobby Holik and said he thought it was because of his emotions. We had a closeup and Mike was still shedding tears during the handshakes. "That showed me the emotions that come to the fore in that moment. This is the realization of a lifetime dream. "I think the hockey world was shocked because Detroit was overwhelming offensively but that was a work-stoppage shortened season and the Western teams hadn't seen the East. I remember Bill Clement saying that after Game 1 in Detroit, the Red Wings said to themselves, 'OK, we've seen them now.' After Game 2, it was, "Boys, we're in trouble.' The Devils went back home and won Game 3. In Game 4, Detroit used a trap and actually led, but Scotty Bowman was trying to get racehorses to do something they weren't used to and the Devils were too good. "I think the first Stanley Cup championship that you are involved in is the one that stands out." Emrick said that while there core members who played on all 3 championship Devils' teams, each club was significantly different. "The Devils became an offensive powerhouse by 2000, an offensive machine that was second to the Red Wings in goals scored," Emrick said. "When they beat Anaheim in 2003, it came down to which team had the best defense. Eventually, it became evident, but the home team won each game so they were close." Emrick said he has been blessed over the years to work with great broadcasting partners, including his current analyst, Glenn "Chico" Resch. "Through they years, I've had some fine analysts to work with and I enjoyed them all," Emrick said. "Mike Eruzione was the first and I've worked with Peter McNab, Sal Messina, Peter Mahovlich, Doug Sulliman and now, Chico Resch for many years. We had Sal Messina when he didn't have a Rangers conflict and in 1986, when Sal couldn't be there, we broke in Bill Clement, a new guy who hadn't done analysis on television. Boy, did he ever take to it and ESPN put their hooks into him and we lost him." There are some things you can start slow and get faster, like typing, and other things, like ski jumping, you need to get right first time, every time. Emrick was asked into which category does hockey announcing fall. He laughed at the ski-jumping reference. "I see your point! My opinion, from having done it, is that it is something that you get better at," Emrick said. "I encourage people who are interested to start the way I did, by going into an arena, finding an empty section and start broadcasting into a tape recorder. Save your tapes for 30 days. That way, you will forget the particulars of the game. You will be counting on your description to understand the game. What aren't you doing that you should? If you haven't been giving the score enough, for instance. "By the time you have your 10th tape, you should be better. Save the first tape forever. You'll get a great kick out of it after you've done 20,000 games. Later, you learn how to prepare for a game. Learn by doing. I'll tell you that I've found the need for preparation gets greater as the years go on. So, I would say hockey broadcasting is not like ski jumping, the learning curve is more of a gradual thing." You would think that someone as cool in front of a microphone as Emrick would sail through his Hockey Hall of Fame induction speech without problems. Actually, there are no sure things and Emrick is aware of that. "I have no idea how I will react when I get up to accept this award," he said. "I think it will be like when I received the Lester Patrick Trophy a few years ago. You see your whole professional life go before you. I'm sure it will be a memory in the making but I don't know how it will grab me. I can't get into too much trouble because I have only four minutes to speak. "This is important: It will be fun to have my wife, Joyce, there. We've been married 31 years and if you go back to when we were dating while I was calling the Port Huron Flags, she's been around hockey for 35 years. "I know almost every guy in my situation has said how important his wife's support has been and I believe them. It's certainly true in my case. To do this, you have to have a stable home life so that you can concentrate on your professional life. That's what I've had, a focused professional life, thanks to her. Of course, there are the things you can't control, illnesses, deaths, etc. But the things that can be controlled, she has done a wonderful job."